Great, now I think I'm crazy. 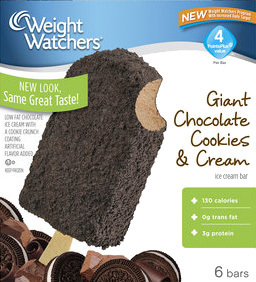 I would have bet money that I've already reviewed Weight Watchers regular Cookies & Cream ice cream bars. Did I not buy a big box of them from BJs? Was that before I started the blog maybe?? Must have been pre-blog I guess. I definitely remember eating them and that they were decent. Not fantastic mind you, this is a low cal treat, but definitely a favorable treat. The first bar disappeared very quickly last night, and I'm about five minutes from grabbing another. I'll try to eat it a bit slower this time as I was quite hungry for chocolate last night. I guess the thing that really wins me over is the very generous cookie crunch coating. It's always there in every bite and that's hard to beat, plus you don't have that annoying shell cracking that you find in a regular chocolate coated bar. The low fat chocolate isn't great, but I don't expect it to be. What I expect is the chocolate to be masked by a pleasant layer of cookie bits and it is. Ok, time for another. On Second Scoop: Guess what? I really can't complain about these. I like them, plain and simple. The cookie crunch is respectable, the ice cream underneath is good enough, not sure what else to say. I kind of wish I had a regular one and a chocolate one to compare. Actually, I know what to say. Guess who makes ice cream for Weight Watchers? Blue Bunny! It really is a small world.